It’s that time of the year when fashion labels release their ad campaigns one after another. We can’t even keep up; every day there is a new collection to admire, a new style to promise your loyalty to. Don’t they know our minds and bodies are incapable of producing dangerous levels of admiration in such a short period of time? The designers at Lanvin definitely didn’t get the memo about it. And they did everything right as the very moment we forgot how splendid their fall 2015 collection was (apologies to Lanvin for these, some of your competitors used the moment), they’ve reminded us about the flawless quality of their craft and mastery (your memory will not dare to erase those moments) releasing the fabulous Lanvin fall 2015 ad campaign. If you’ve seen the collection on catwalk, you’ve probably witnessed a diversity influenced by cultural motives and chic, rich colors and feminine silhouettes. Nothing has been lost, quite the opposite, everything has added up. The ad campaign features the same elements, only this time they’ve chosen to stress the most eye-catching advantages. The vibrant gold and copper, contrasted on the dark black background and garments amaze and intrigue. Most of the ads are featured in action, giving out the sense of free motion your dress should display when walking. The campaign was captured by Tim Walker, the British photographer often favorited by Vogue. If you’re following the latest fashion ads, you’ve probably noticed that one thing Walker absolutely loves in photos is drama‚Äö√Ñ√∂‚àö√ë¬¨‚àÇ and lots of it. It’s clearly expressed in the campaign images, meant to activate women who dreamed of an epic romance, women who dreamed of going down in history. Watching how Walker sells an entire collection without even showing the models’ faces is unbelievable. The list of models that did a great job in bringing the mystery into the campaign includes Baylee Soles, Hollie May Saker, Kelsey Soles and Zoe Bedeaux. The models have been styled by Jacob K.
One of the most intimate details that Lanvin has always been famous for is, of course, lace. It’s not news, everyone knows how this fashion house uses lace the way sculptors use stone; they breathe life into it and make it a living phenomenon. 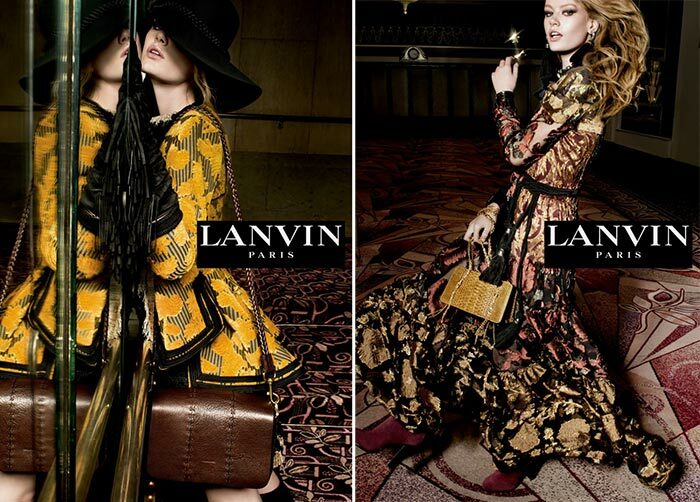 Same goes for Lanvin; lace becomes alive on their runways and campaigns. The dresses radiate seduction, turning regular models into muses. What kind of a woman would say “no’ to a Lanvin lace dress (in fact, you can use this factor when proposing; it works, proved and tested)? Fur vests, see-through dresses, fitted black dresses, accessorized with tempting red on bags and shoes‚Äö√Ñ√∂‚àö√ë¬¨‚àÇ It’s a new combination of mess and determination, a clumsy style covered in fur and fitted waists. 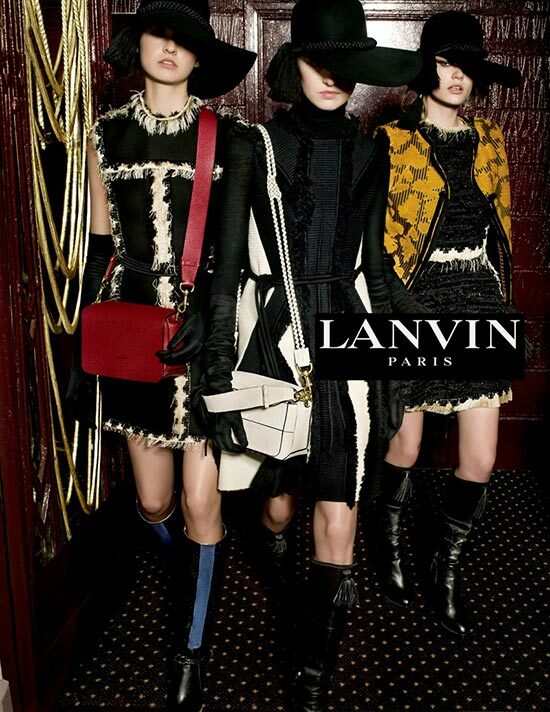 This is the new Lanvin ad campaign for fall, encompassing the best moments you had during the runway show. Carrying some of the oldest traditions of the French fashion, Lanvin is undoubtedly today’s winner. Its catalogue should be your bedtime book, the board for inspiration and the direct result of a shopping mission. 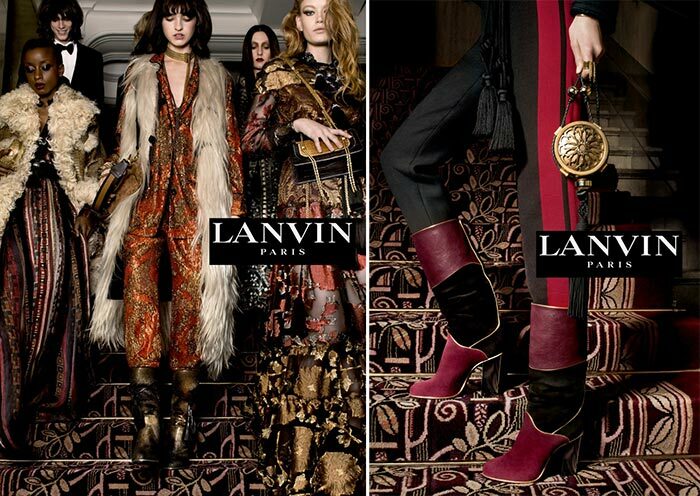 Enjoy your Lanvin, it brings good luck!